Despite actively trying not to spam overload my Instagram feed, I did inevitably share many holiday photos, and so many of you loved my outfits that I got lots of lovely messages and comments asking where things were from. So I thought it might be a good idea to do a blog post where I can share the links and talk you through them in a little bit more detail. A lot of these items went in the sale, which is always a good thing if you want to buy, although it also means a few have now sold out, so I’m apologising in advance! Shopping for a summer holiday in the winter and vice versa can be a bit of a challenge, but I always find online to be the best option as they tend to have more choice and variety than in store. Asos is just my go to anyway, but with them having such a huge variety of pieces and brands they were a saviour for me in finding summer dresses in November, so I definitely recommend checking them out if you’re struggling with the same issue. 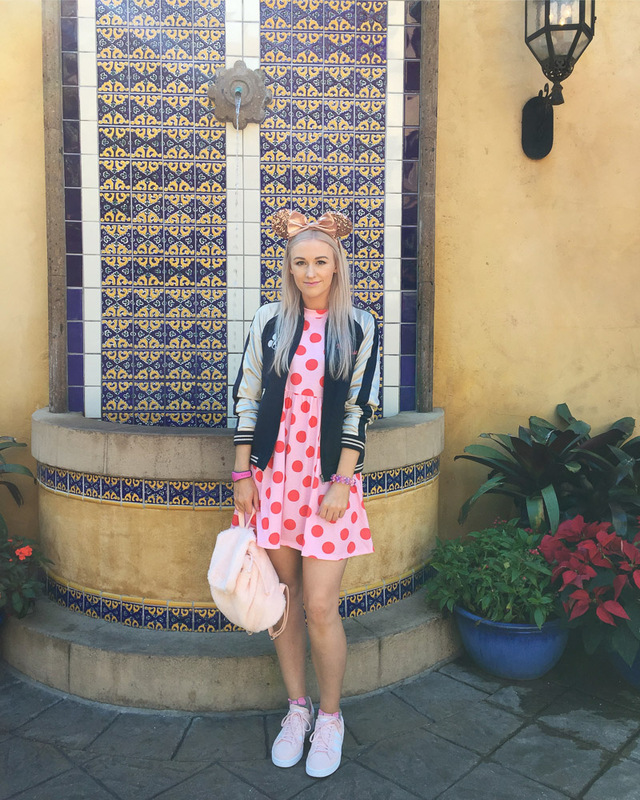 I do have a very colourful and girly style and I can’t resist anything cute or Disney related, and I decided to just go all out for my outfits this holiday. But hey, I figured if you can’t at Disney World, when the hell can you eh? It’s going to be a long one, so without further ado, here we go. 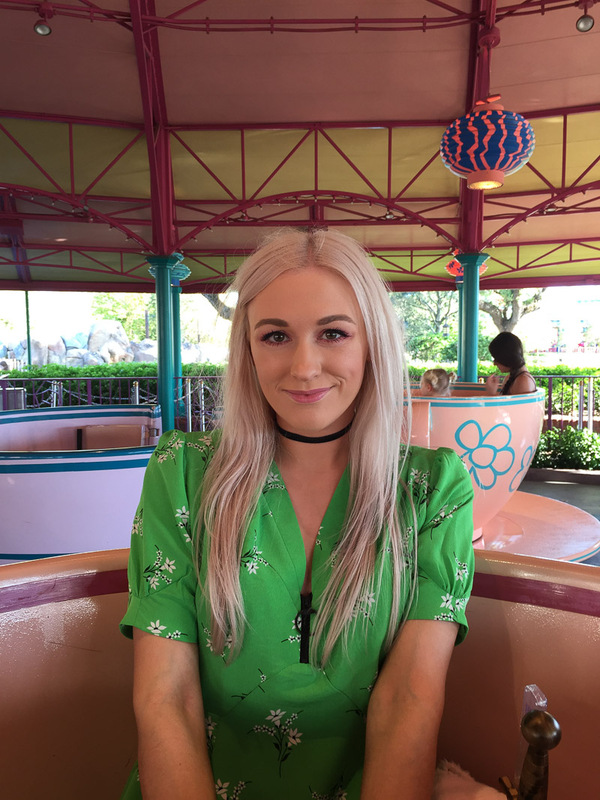 I thought I’d go through these chronologically, starting with my outfit for our first day, which we spent at Magic Kingdom (always the first park I do when we go). 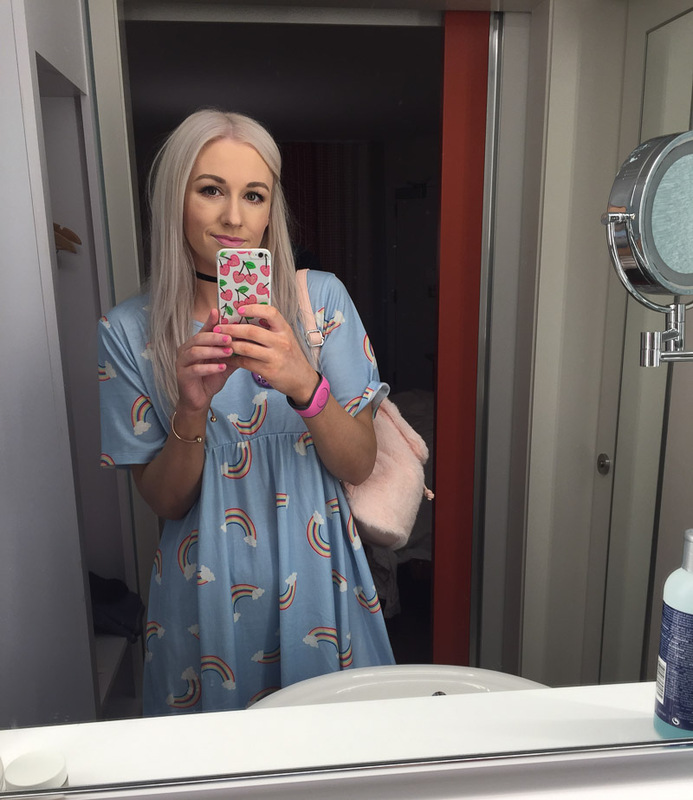 And OMG this dress, it has rainbows on it! Need I say more? It’s made of the loveliest jersey cotton which made it super comfy and light to wear in the Florida heat. The baby blue colour was perfect for the bright sunny day we had. Now, confession time, before this holiday I didn’t own a single pair of trainers. I know I know, how you say? They’re just not me. But comfy footwear is an absolute must have for an Orlando holiday with all the walking you’re doing around the theme parks, so I had to do the sensible thing and buy some. I spent a while looking at the different styles, and ultimately landed on these baby pink suede ones from Adidas. I’m not going to lie, it was the colour that drew them to me (big surprise), but after trying them on I was so glad I ordered them as they were definitely the comfiest ones out of the several other pairs I tried. 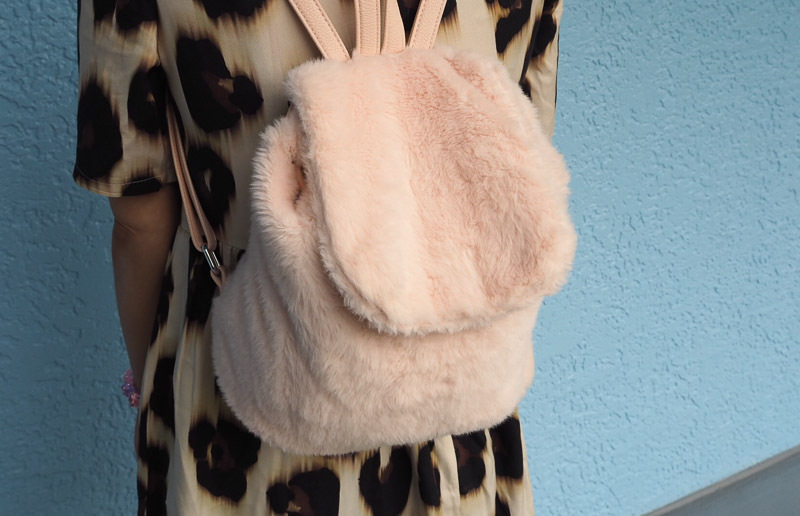 In addition to the trainers, you’re going to see a lot of this utterly adorable baby pink faux fur backpack throughout this post. I actually bought this a couple of years ago now, and it’s just been sat in my cupboard. When I started shopping for my holiday, I remembered I had it and how perfect it would be. It got so many compliments! It was just the right size to fit everything I needed in whilst we were out without being too big to take on the rides or too heavy to carry. Sadly it isn’t available anymore as I bought it so long ago, but there have been a few similar ones around lately so I’ve linked the closest I could find. 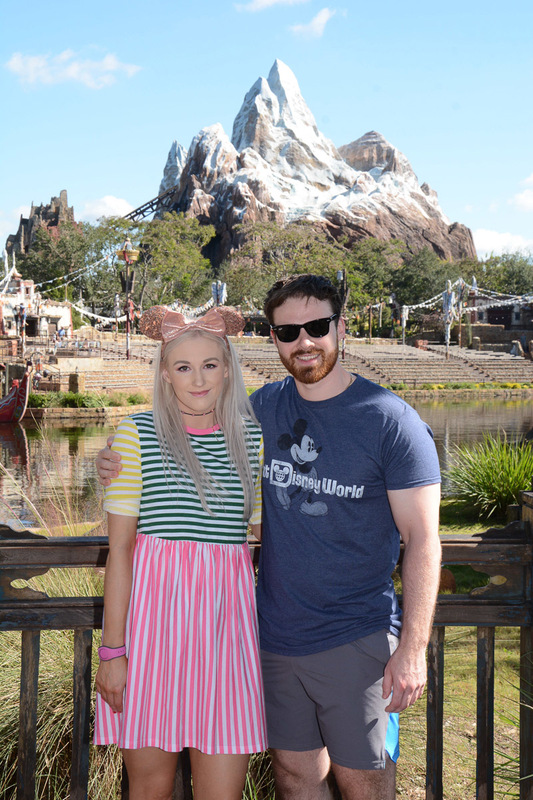 For day 2 we headed to Animal Kingdom, which really stole my heart on this trip. Whenever I go there, I like to find a way to incorporate something animal inspired into my outfit. When I saw this animal print dress on Asos I knew I needed it. I wore it with the second pair of trainers I bought, a plain white canvas pair also from Asos. This was actually one of the days where we had the most rain, so a rain mac was necessary later in the day. Having been to Orlando many times before, I’m well aware of the changing weather and the rain you can get there. 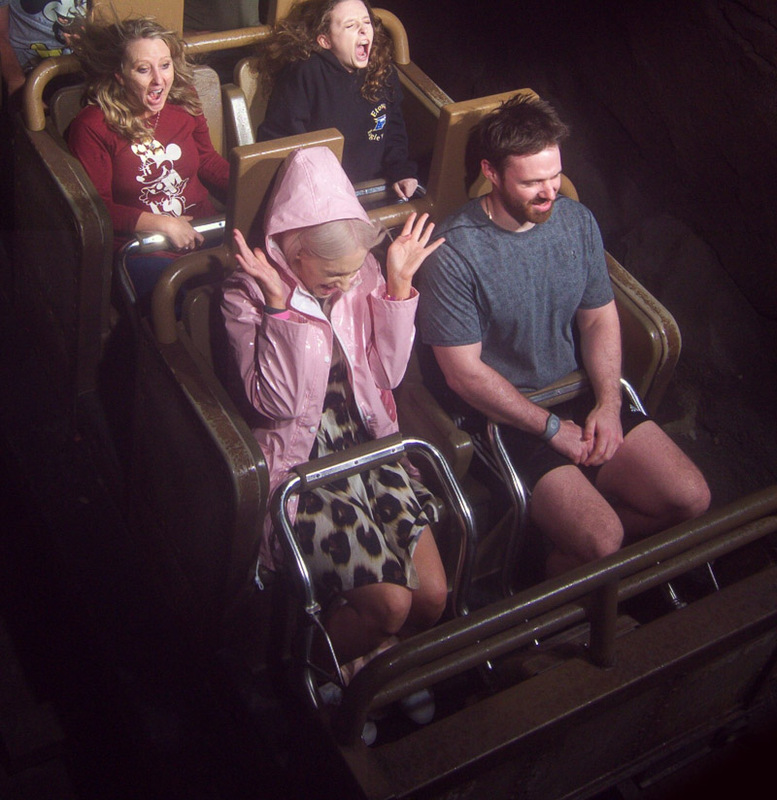 Umbrellas just aren’t practical in the theme parks, so I purposely bought myself a light, hooded rain mac. As I’d gone for a few baby pink accessories already, I really wanted a jacket in the same pastel hue, and I ended up finding one from New Look, who had a great selection at really affordable prices. This next outfit is from what was one of the best days of our entire holiday. 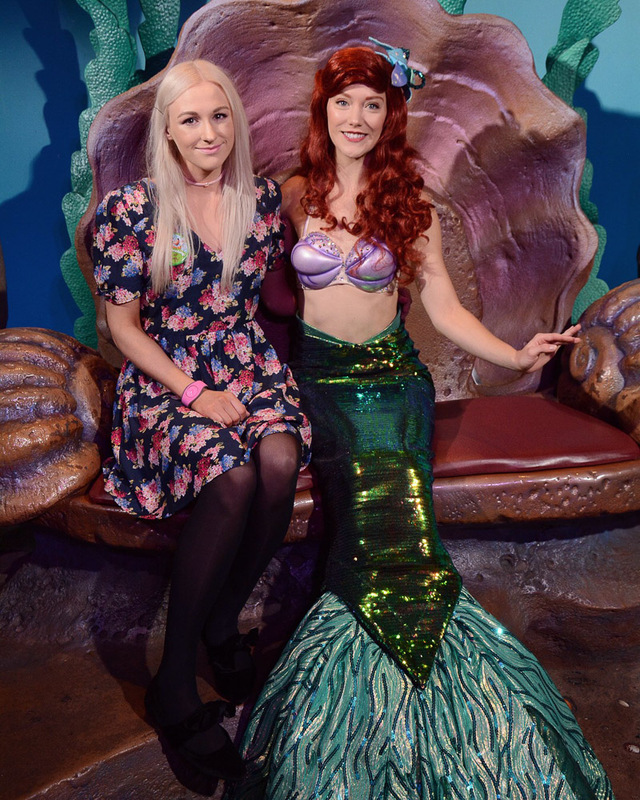 We had breakfast at Be Our Guest restaurant (which is set inside the Beast’s castle from Beauty and the Beast), I met Ariel in her amazing Under the Sea Grotto, I FINALLY got my hands on a pair of rose gold Minnie ears (I’d been endlessly hunting everywhere since we arrived for them! ), and we did 3 different parks in one day. 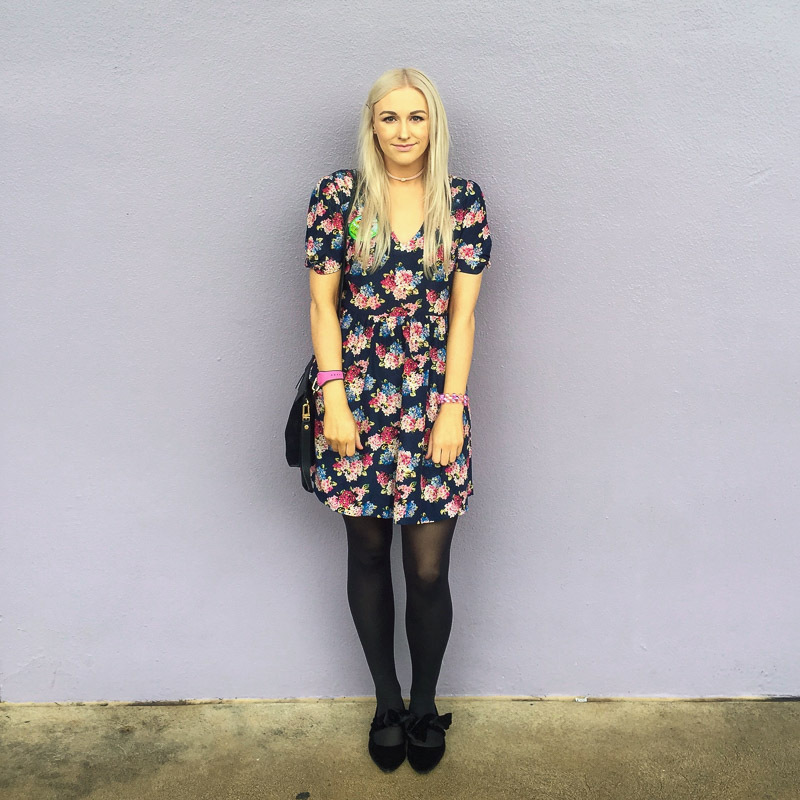 This floral tea dress is one I’ve had for a few years now and always a favourite for the summer. I can’t even remember where it’s from I’ve had it that long. It was a cooler day; hence the need for tights, so I opted for some black velvet pointed flats with a tie bow across them from New Look. They were such a soft material and comfier than I thought they’d be. My bag was another staple accessory throughout the holiday. It’s from Dune, and what really attracted me to it was how versatile it is. It can be used 3 ways, firstly with a black strap to be worn as a cross body style, secondly it has a gold chain for a more evening/dressy look, and finally it has a wristlet strap so it can be used as a clutch as well. Plus it’s classic black suede so goes with anything. Next up is a dress that was a no brainer. 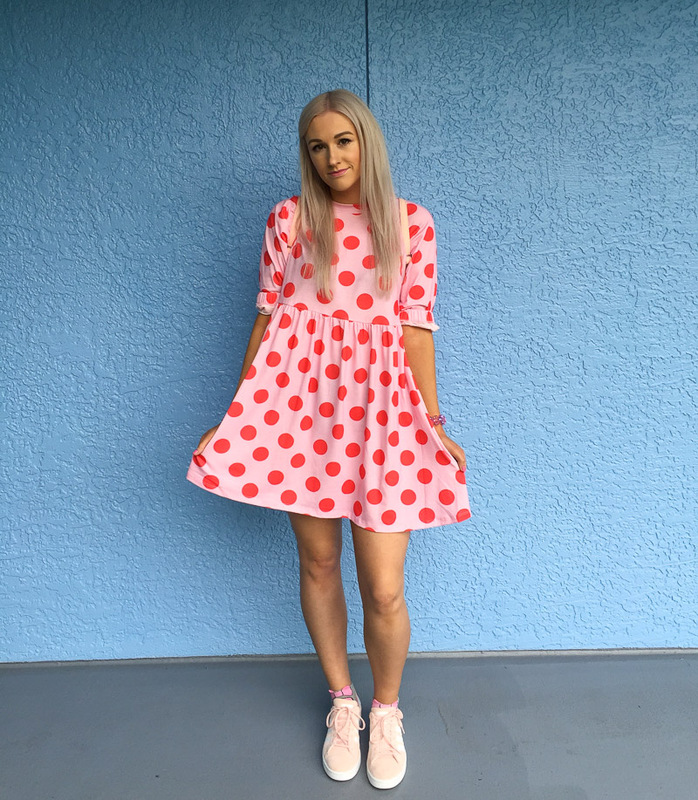 It’s pink and red polka dots in the same jersey cotton as my rainbow dress and also from Asos. It was way too cute to resist and a full on Minnie Mouse dress. Paired with my baby pink trainers and backpack, it was probably the girliest and most cutesy of all my looks. I wore it to Epcot on a day that started out quite chilly. The jacket I wore I bought from Uniqlo at Disney Springs on one of our first nights there. It’s a Minnie Mouse bomber jacket, which couldn’t be more perfect, and got me through the cool evenings throughout the holiday. Now for an outfit worn on a very special evening. 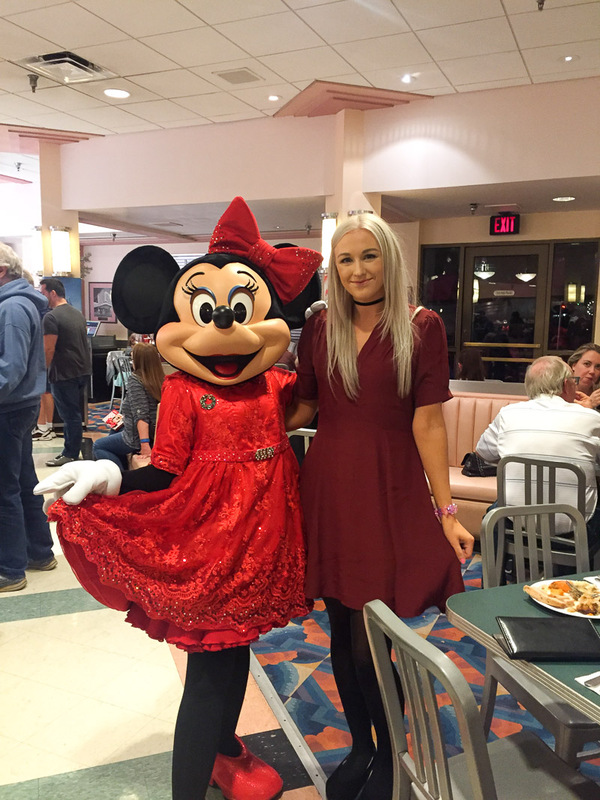 I booked for a dinner at Hollywood and Vine at Hollywood Studios, which is one of the Character dining experiences at Disney. This particular dinner was Minnie’s Seasonal Dinner Party, with Minnie herself playing hostess in her festive Christmas outfit along with Mickey, Daisy and Donald Duck, and Goofy in his Santa outfit. I had to dress up for Miss Minnie, so I opted for this beautiful maroon red zip front tea dress from Asos. I finished off the look with my black Dune bag as before and some black suede pointed flats. And yes, I was way more excited than the kids there. 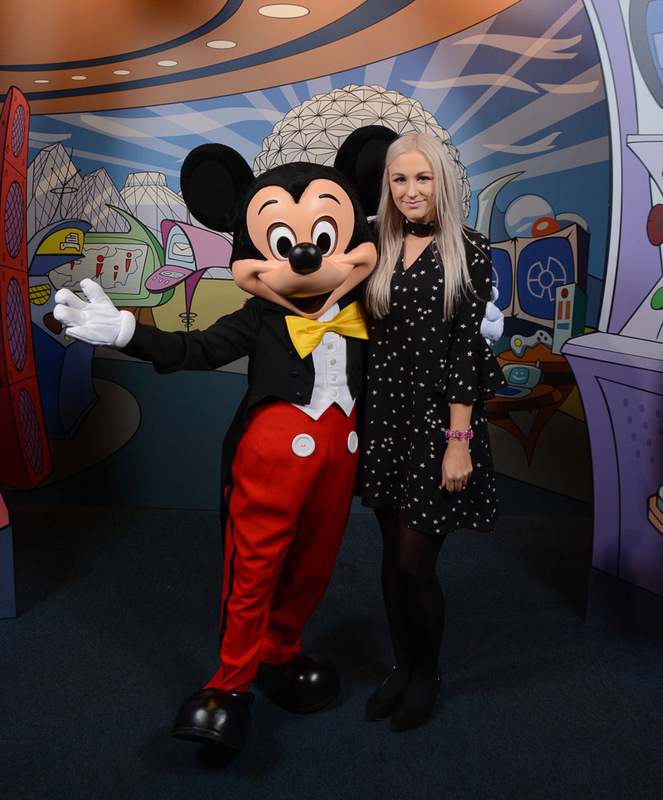 Can we also just appreciate Minnie’s outfit? She was serious outfit goals. 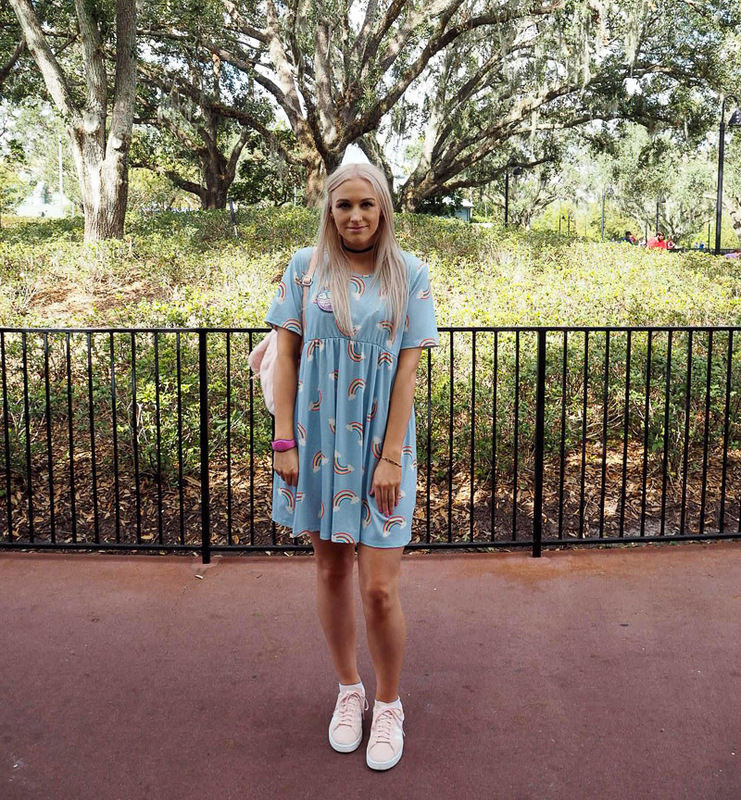 This next dress I wore twice, once to Universal, and again to go shopping at the Mall at Millenia (my favourite mall) followed by an evening at Animal Kingdom. 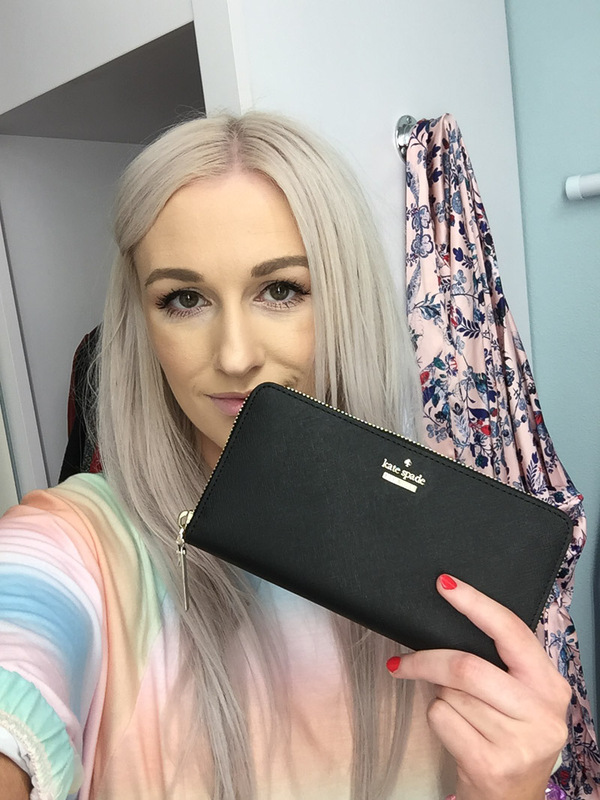 Whilst shopping, I treated myself to a new purse from Kate Spade, who has long been one of my favourite designers however I was yet to own a piece. I’ve had the same purse for a very long time so I was definitely in need of a new one, but I had no intention to buy one whilst we were shopping. We were in the US over Black Friday weekend, and I noticed Kate Spade had 30% off whilst we were passing so I had to go in and have a look. I knew I wanted a classic black purse, and I’m in love with the one I chose. 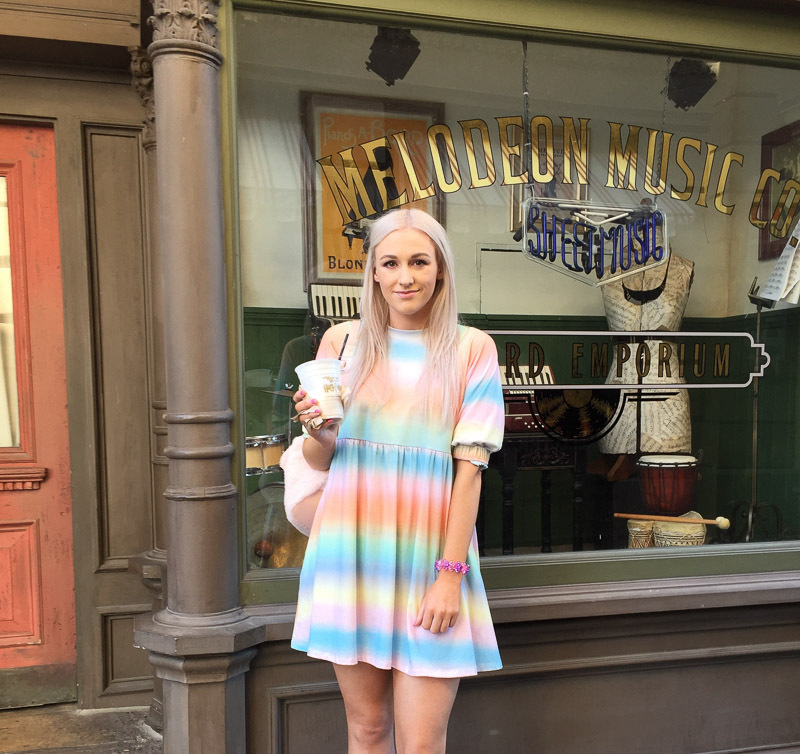 But back to the outfit, and the dreamiest pastel ombre smock dress. The same shape and material as my polka dot one, this particular dress was probably the one that got the most compliments from people. I absolutely loved wearing it! 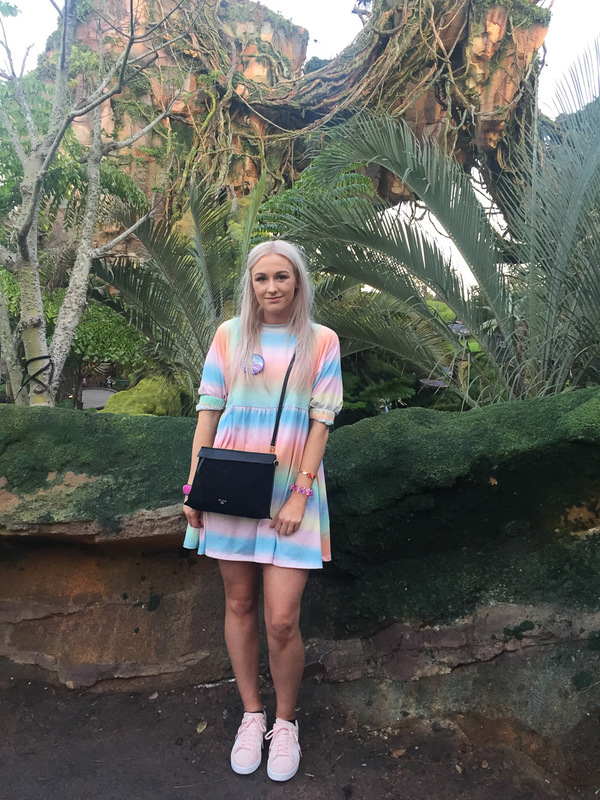 I wore it on both occasions with my Adidas trainers, firstly with the baby pink backpack and then with my black Dune bag worn as a cross body for Animal Kingdom. 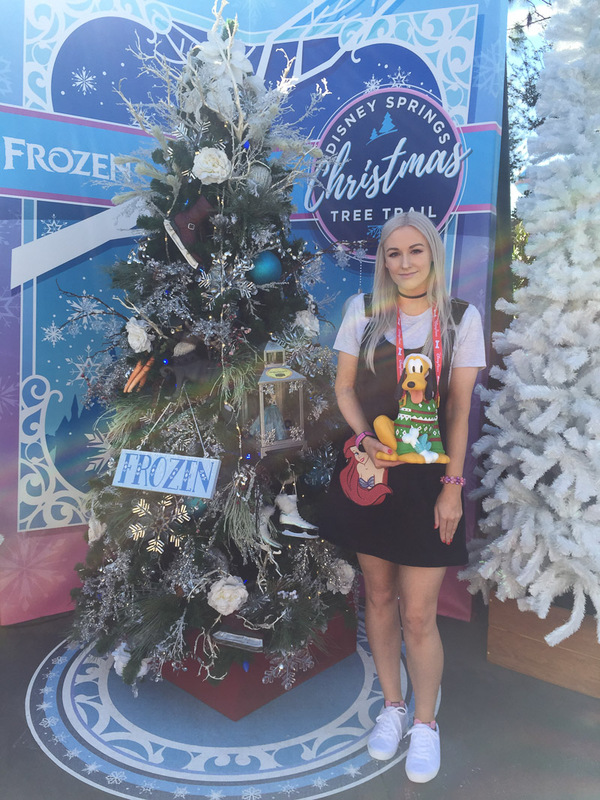 One thing I was really looking forward to doing this holiday was the Christmas Tree Trail at Disney Springs, which is Disney’s entertainment destination full of great restaurants, bars and the most incredible selection of shops. 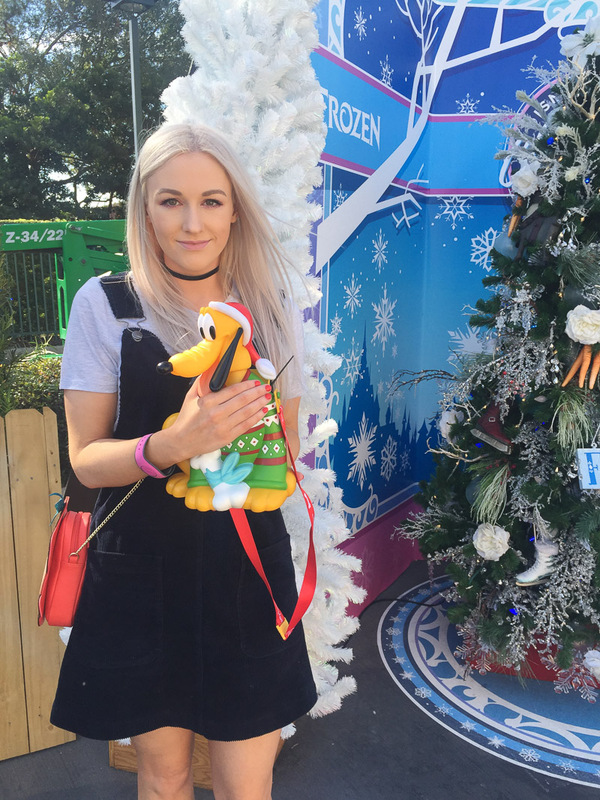 The Christmas Tree Trail was so much fun, with lots of different trees decorated to the theme of Disney characters and movies. I knew we were going to have a more chilled out day of shopping and some lunch as well in the gorgeous sunshine, so I went for a more laid back, casual look. This navy corduroy pinafore is from Monki but I’ve had it since 2016. 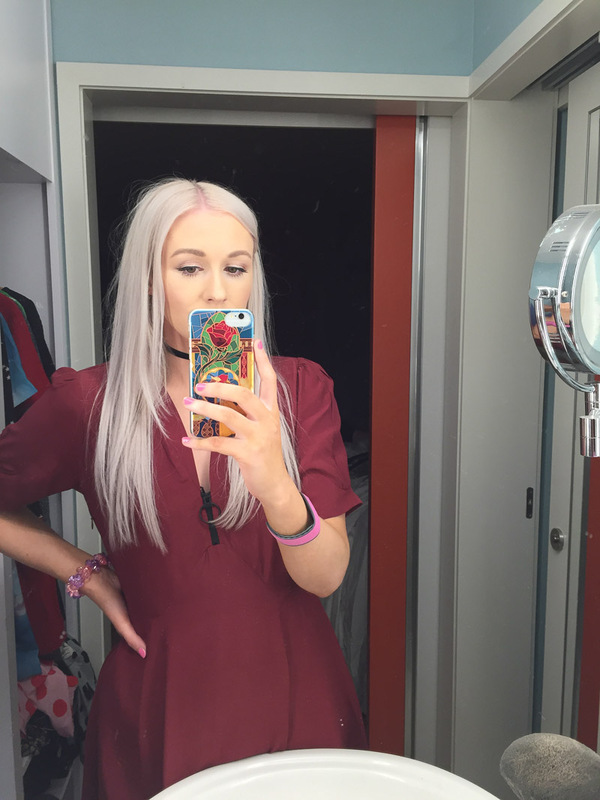 I also wore a plain grey cropped t-shirt from Topshop and my white trainers from Asos. It was my bag that I let make the statement with this outfit. It’s from Danielle Nicole, who makes the most amazing bags. 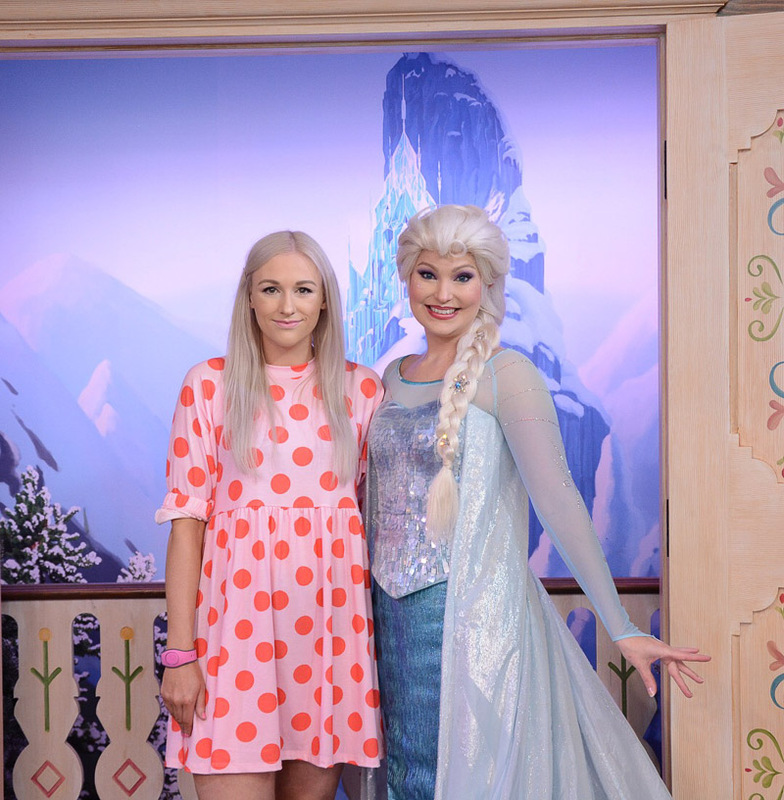 She has a whole Disney collection and I pretty much want every single one. They’re gorgeous! I wanted to treat myself to one for the holiday but I had a hard time narrowing it down to just one. 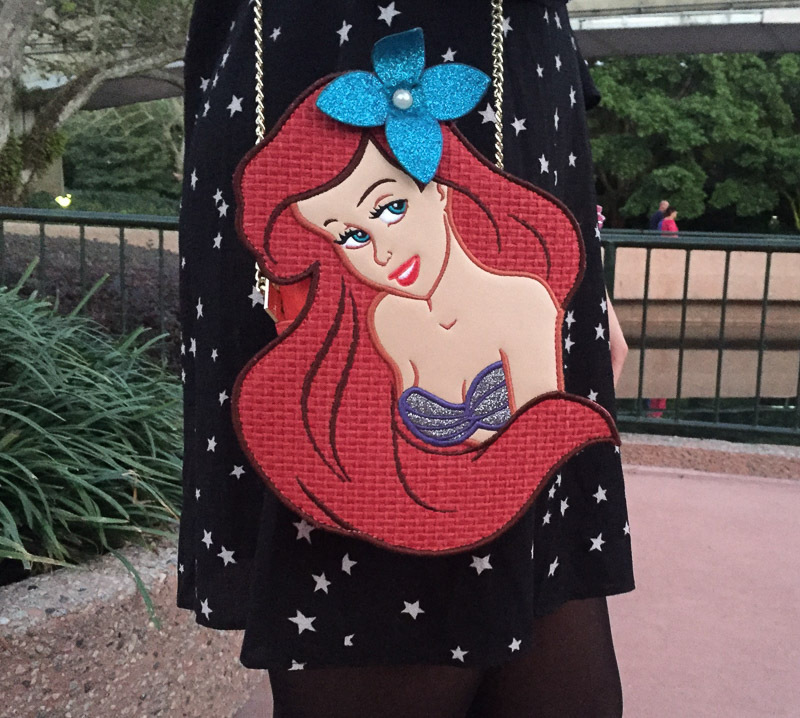 I ended up choosing this Ariel one. 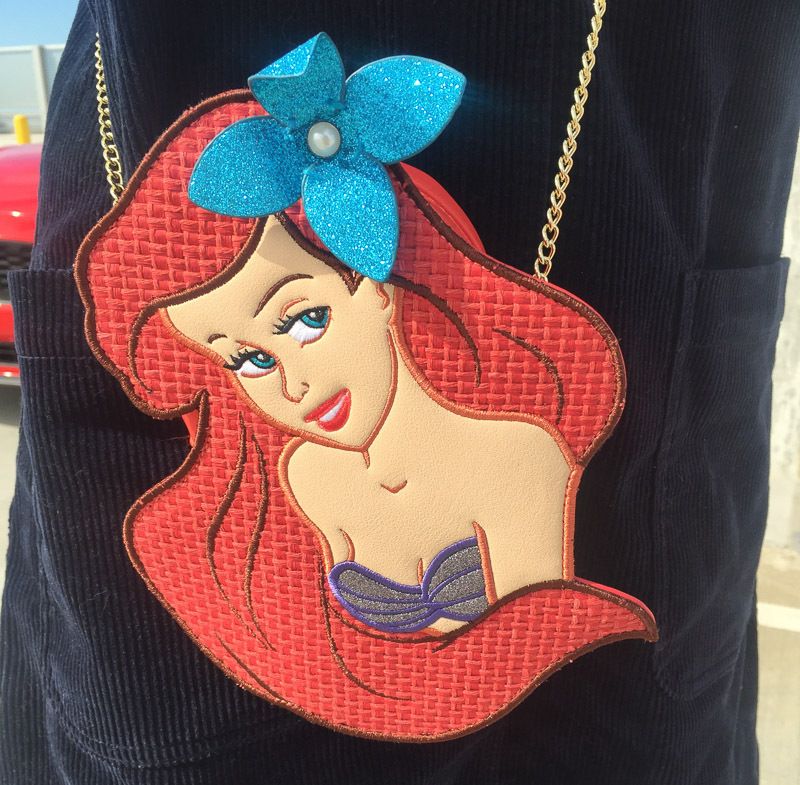 The Little Mermaid has always been one of my favourite Disney films and Ariel is one of my favourite Princesses. And it also came out the year I was born, which I just love. The bag is a really lovely small size and fits just enough in it, with a nice gold chain so you can wear either over the shoulder or cross body. I’m already eyeing up a couple of others from the collection. FYI, the giant Pluto is actually a popcorn bucket! Coolest popcorn bucket ever! Later that same day we went to Epcot for the evening. I wore the same Danielle Nicole Ariel bag but changed into a black and white star print dress from Glamorous. I can’t resist a star print, and I love the tie back of the choker neckline. For what I already knew was going to be the best day ever, I wanted a dress I’d feel good in. 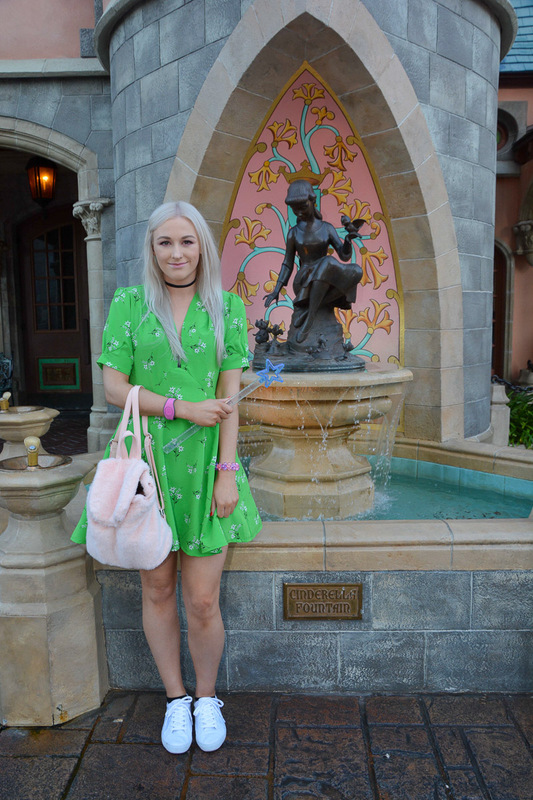 The same style as the maroon red Asos dress I wore earlier in the holiday, this bold green floral tea dress was love at first sight and is probably the dress I’d recommend to anyone looking for a Spring/Summer dress right now. It’s also the dress I had the most photos taken in because it was such a great day. Despite how many times I’ve been to Disney World before, one thing I had never done was go inside the castle. There’s actually a restaurant inside, and I managed to get a reservation for breakfast. It was even more magical inside than I imagined. 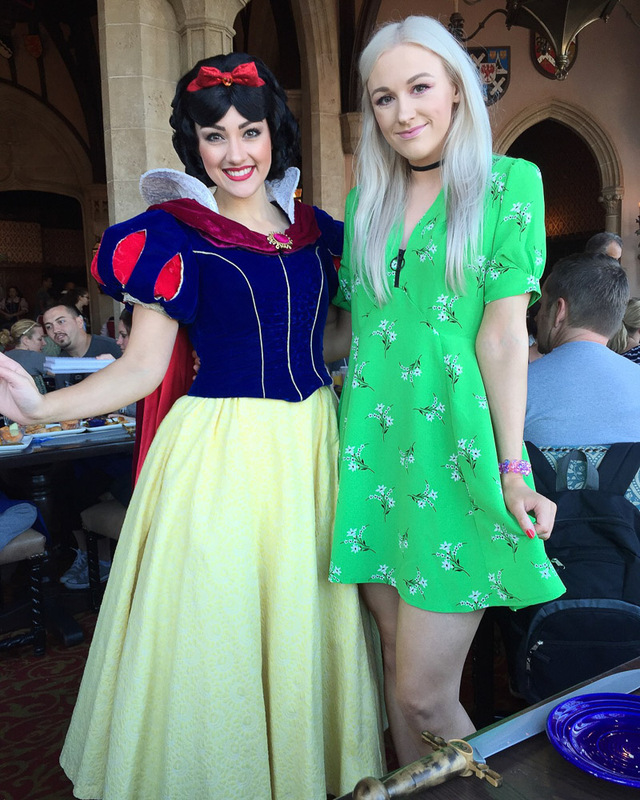 You’re greeted by Cinderella as you enter her castle, and we were joined by Snow White, Aurora, Ariel and Jasmine during breakfast. It also happened to be the most delicious breakfast, and was worth every penny. Highly recommend to anyone with a Disney World trip planned. 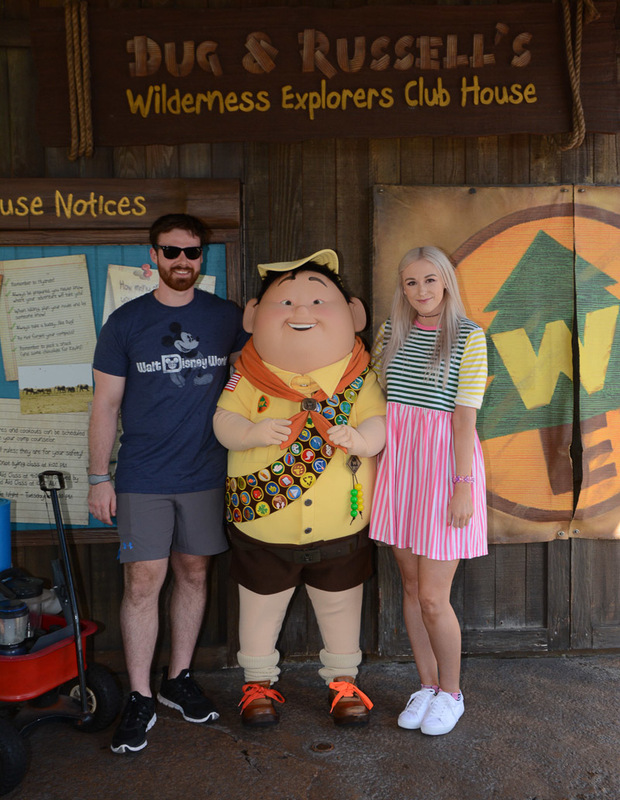 Another colourful dress, this contrasting striped number was worn to our last day at Animal Kingdom. I’ve always been a fan of print and colour, and this was a great addition to my holiday wardrobe and was another Asos find. We had such a fun day, with some of my most cherished photos from the entire holiday. With it being such a bold pattern and colourway, I kept the rest of my look simple with white trainers and pink furry backpack. 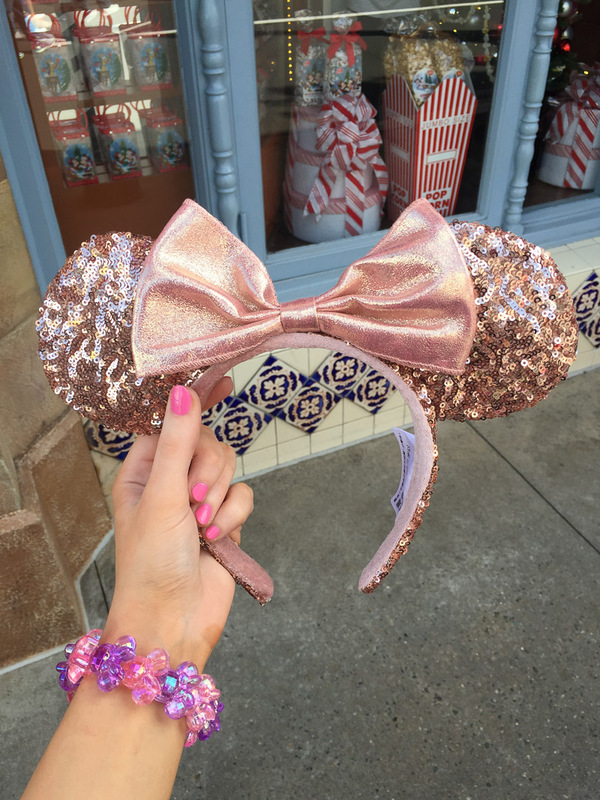 Of course the rose gold Minnie ears made an appearance too. My final outfit was for Mickey’s Very Merry Christmas Party, a special ticketed event at Magic Kingdom. Some guests go all out in the Christmas outfits, but for some reason I couldn’t get Lance on board with doing a couple’s Christmas dress up. So I instead chose a red textured dress and some red Christmas Minnie ears. It was quite a cold evening, so I went for tights, black flats and my Dune black bag, along with my Uniqlo Minnie bomber jacket. It was quite a busy night and I wanted to enjoy every minute of one of our last nights there, so I only ended up having the one photo taken. 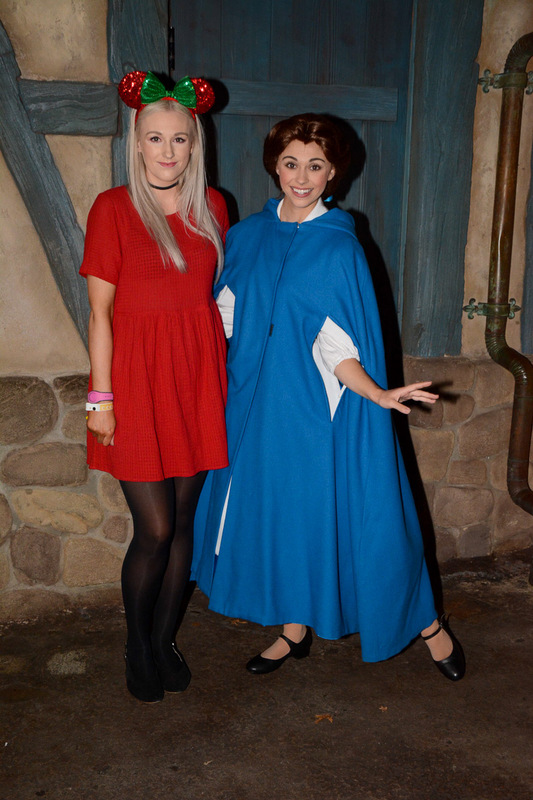 But it was with Belle, so that makes it a winner. So there we have it. 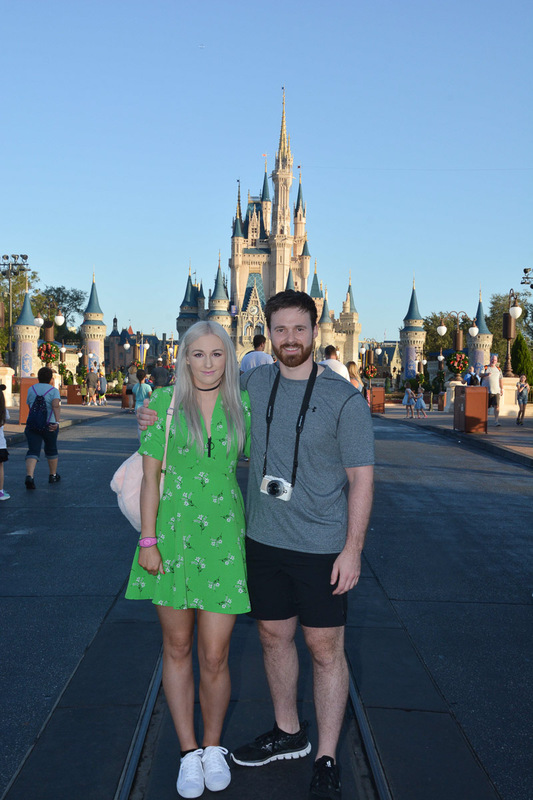 We spent the most amazing 2 weeks in Orlando and I loved every minute of it. There are a few other outfits I didn’t end up with any pictures of, but the ones I’ve shared with you I loved wearing and I hope to find ways to work them all into my upcoming summer wardrobe as well. I’m trying to think of what’s my favourite dress but I just can’t choose.